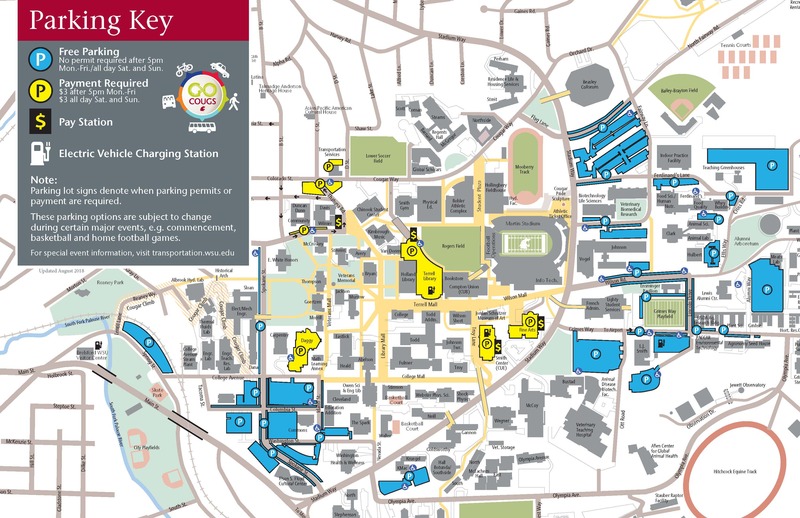 PULLMAN, Wash. – Washington State University Transportation Services and the University Parking and Transportation Task Force are recommending parking rate increases beginning July 1, 2019 on annual and daily parking permits. The new rates, which would affect the Pullman campus only, are equivalent to cost of living increases in the U.S. Bureau of Labor Statistics 2018 Western Urban Consumer Price Index and are within the allowable limits set forth by the Board of Regents. The proposed increase in permit rates would be the first in four years, if approved by WSU president Kirk Schulz. The table below shows the details of the recommended permit rates. WSU Transportation Services is fully self-supported and does not receive federal, state, grant or tuition funding. Revenue from parking fees and fines directly support capital projects and maintenance and operations of the WSU parking system. “Revenue from this proposed parking rate increase will enable us to make sure our facilities remain in a good and safe state of repair which is critical to serving the needs of our growing campus community,” said John Shaheen, director of WSU Transportation Services. The recommended rate increase is needed to support the maintenance, repairs and replacement of existing parking facilities, such as structural and elevator repairs to four parking garages and asphalt repaving and patching at a cost of $2.6 million over the next five years. Additionally, another $1.2 million in renovation is planned over the next five years for equipment replacement to improve garage access, parking vending machines and alternative transportation improvements, such as repairs to shared bike and pedestrian pathways. Current permit holders who wish to explore other commute alternatives are encouraged to take advantage of Transportation Service’s Coug Commute Advisor program. The program offers customized commute plans for students, faculty, and staff. Alternative commute options include bus service, vanpools, carpools, biking, walking, or a combination of alternatives. Contact Transportation Services for more information. The 15-member University Parking and Transportation Task Force was established to provide WSU Pullman with a global campus perspective and broad representation on parking and transportation issues. The task force members meet monthly and represent various university groups, including the Associated Students of Washington State University, the Residence Hall Association, the Graduate and Professional Student Association, WSU faculty and others. Additional financial information regarding Transportation Services can be found on the Transportation Services website here. The bollards blocking off the portion of Terrell Mall from Troy Ln. to Library Rd. have been removed in order to allow for snow removal on the mall. Even though the bollards have been removed, this portion of the mall is still restricted to emergency vehicles and WSU Facilities Services vehicles that have an operational need to access the mall. All other vehicular traffic must use an alternate route. Please contact WSU Transportation Services with any questions. Blue 1 lot east of South Fairway Playfield. Note: residence hall students with Blue 1 permits are allowed to park in the designated area of this lot. We apologize for any inconvenience this may cause, and we appreciate your patience and cooperation. Please refer to the football parking map for more detailed locations of affected lots. With a new academic year underway, WSU Transportation Services is reminding folks to check out its evening and weekend parking map showing which lots are affected after 5 p.m. on weekdays or all day Saturday and Sunday. The map provides a detailed look at where visitors with or without a parking permit can park for free (noted by the blue areas on the map) or at a discounted flat rate of $3 (noted by the yellow areas on the map). WSU will be conducting a temporary traffic revision that closes a portion of Thatuna Street to all vehicular traffic (see map below). The closed portion of Thatuna St. will be between the intersections of Linden St. and Colorado St. During the revision, north bound traffic on Thatuna St. will be diverted down Linden St. 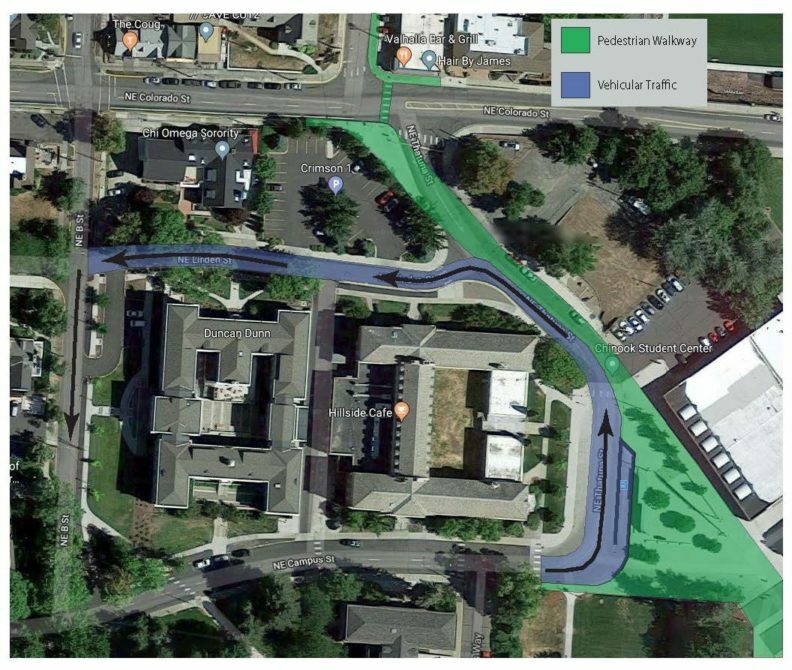 The goal of the revision is to improve the safety and efficiency of the Thatuna Street area for pedestrians, bicyclists, public transit, and vehicle traffic. The temporary revision will begin June 5th and end on June 29th. As a result, the four spaces in the northeast corner of the Green 4 gravel parking lot adjacent to the Chinook Student Center will be closed during this time. The rest of the Green 4 gravel parking lot, closer to the Chinook Student Center, will remain open via a temporary driveway. The entrance will be denoted through the use of orange candlesticks, and we ask that vehicles use extreme caution when pulling into the parking lot, as pedestrians and cyclists may be present. The paved Green 4 parking lot across the street from these lots (north of Wilmer Davis Residence Hall) will still be available, as well as the paved Green 4 parking lot behind the Transportation Services building. Additionally, the metered parking on Thatuna St. in front of the Chinook Student Center will not be available during the revision. Temporary detour signage in the area will be in place for the revision. The closed section of Thatuna St. will serve as a temporary pedestrian mall during the trial period. This will keep pedestrian traffic on the right side of Thatuna St. heading towards Cougar Way, giving pedestrians a direct path to the intersection. All vehicular traffic will remain on the left side of Thatuna St., separating vehicles from pedestrians. The revision is being conducted in an effort to improve pedestrian flow, safety, and connectivity from the high density College Hill residential area to the core of the WSU campus. Currently, the intersection where Thatuna St. and C St. connect to Colorado St. is misaligned, causing line of sight issues for pedestrians, vehicles, and buses. WSU chose to do the revision during the summer in order to test the feasibility in ideal weather conditions and lower overall traffic volume. Washington State University Transportation Services will offer annual campus parking permit renewals for current annual permit holders for 2018-19 on the web beginning at 10:00 a.m. Tuesday, May 1, 2018. If you do not already have an annual permit, please see Phase 2 of PERMIT RENEWAL/PURCHASE PHASES below. Note: If you currently live, or will live in a Residence Hall in fall 2018, you are not eligible to renew your permit. Please see RESIDENCE HALL PERMIT SALES PHASES below. Accurate vehicle and license plate information will be required before you renew your permit, please make sure all information for vehicles you want associated with your permit have up to date information in your parking account. If any information is outdated, contact Transportation Services with the correct vehicle information so we can ensure your account is accurate. Go to transportation.wsu.edu and click on “My Parking Account”. Log in with your WSU Active Directory. Click on your Current Permit. If you need to make any updates to the vehicles on your permit, please contact Transportation Services by email at transportation@wsu.edu, or by phone at 509-335-PARK (7275), or you may come into the office in person. all account ticket balances must be paid in full before a permit can be renewed or purchased. Account ticket balances can be paid online by logging into your My Parking account. Permit rates will not increase for the 2018 – 2019 permit cycle. In this phase anyone may purchase an available permit and add themselves to requested waitlists. During this sale residents qualifying for the priority sale may purchase their Crimson permit. Residents eligible for this sale will be contacted directly by email. If you have questions regarding your priority points for the Residence Hall Priority Sale please contact Residence Life at 509-335-1227. This phase is when residents ONLY can purchase their permit. Before going online to renew please remember a valid WSU Network ID is required to renew a parking permit. Anyone who has lost or forgotten their network ID can retrieve it online at https://reset.wsu.edu/ or by calling the WSU IT Phone Desk at 509-335-HELP (4357). Those wishing to renew permits online should also ensure that their primary mailing address with the university is current. Mailing addresses can be checked through the “MyWSU” system. For more information, contact WSU Transportation Services at 509-335-PARK (7275) or email us at transportation@wsu.edu. Are you interested in saving money, reducing stress on your commute, and building lasting relationships with fellow WSU staff, faculty, and/or students? We urge you to sign up for a now forming vanpool at Zimride! The Transportation Options team at WSU is trying to grow WSU’s vanpool program in an effort to offer an affordable alternative for commuters, reduce parking and traffic congestion on campus, and contribute to the state of Washington’s Commute Trip Reduction efforts. Here are some of the general areas we’re hoping to generate vanpool interest: Moscow, Colfax, Lewiston/Clarkston, Palouse, Potlatch, and Colton/Uniontown. Click on this link to sign up for a Now Forming vanpool near you. Also, in the meantime, if you’re interested in carpool, enter your commute on Zimride and try to find other drivers and riders making the same commute as you, and share the cost of your commute. If you’re interested in learning how much you could save, go to this website to determine how much you’re currently paying on your commute. You may be paying more than you think, and vanpool can help you save thousands every year. Most vanpools consist of staff and faculty members who work an 8am-5pm, or similar, schedule. Thus, students typically don’t fit well into a vanpool group with regimented times. However, for students whose schedules would fit this type of schedule you are welcome to look into joining a vanpool as well. If you are interested in one of the above Currently Operating or Prospective vans that need riders, please email me directly (contact info in signature). Please also remember to sign up on Zimride. Please contact Transportation Services if you have questions regarding the Vanpool program. We can also put you in touch with current vanpool members if you’d like to hear testimonials on riding in a vanpool.